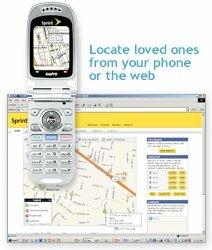 The desire by caring parents to track a child's every move is now possible with Sprint Family Locator - a real-time GPS based tracking service for parents worried over whereabouts of their children. The service lets parents look at maps on their cellphones or computers to locate their children who also carry mobile phones. Parents can also program the service to automatically send them text messages at specific times each day to confirm that their children have arrived at home or in school. Sprint's service shows data such as street addresses to which a child is close and the estimated accuracy of the reading, which could range from a radius of 2 yards around the child to a radius of hundreds of yards. The child is notified by a text message each time his or her location is provided to the parent or guardian, ensuring open communication. Sprint follows The Walt Disney Co., which last week unveiled a mobile service designed to allow parents not only to monitor their children’s locations but also control their mobile phone use. For $9.99/month, subscribers can register up to four phones to locate, get unlimited location requests and send 100 text messages to each child phone.